Those of you with a finger in the general music pie will have noticed the slice that consists of folk music (or influences thereof) has had huge surge in popularity over the last 2-3 years. Some have cleverly named it “nu-folk” (after a certain metal scene some may recall from the start of the last decade) and, with the recent, inexplicable rise of acts such as Ellie Goulding, it seems that it is still having pretty sizeable influence. Britain is more sensitive that many had realised. The most notable bands to come from this new trend include the excellent Mumford & Sons (featured here), Laura Marling, Noah and the Whale and today’s focus Bon Iver (pronounced “Bon-ee-veir”, it’s amalgamated from the French “bon hiver” meaning “good winter”). 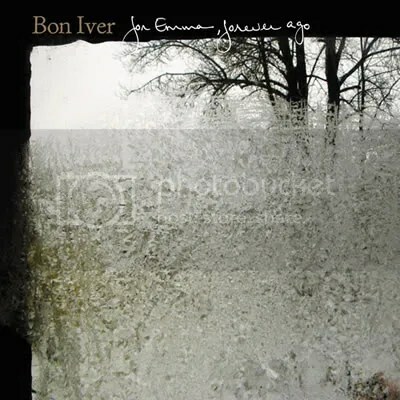 After spending 3 months locked away in a log cabin in Wisconsin and armed with only a few instruments, Justin Vernon – the man behind Bon Iver – emerged with the beautiful and fragile album from where we take today’s lyrics of the week. For Emma, Forever Ago (written for a real ‘Emma’ although probably not that long ago) is an album for the new age, sensitive music buyer and is a heart-wrenching and brilliant drop to the depths of sadness. Tracks such as Flume, Skinny Love and The Wolves (Act I and II) are not only melodic, hypnotizing songs, but also have a real fragility about them thanks in no small part to Vernon’s wonderful, falsetto voice. Vernon sings in this haunting falsetto voice (with a small nod to Neil Young) throughout the album but it’s on today’s track Re: Stacks that it really comes into it’s own (you can hear it below). It’s a beautiful, six-minute folk epic that is, for me, the undoubted best in the Iver canon and just so happens to contain the best and most poetic of all Vernon’s lyrics. “This is not the sound of a new man or a crispy realisation. It’s the sound of the unlocking and the lift away. Not only does it sum up the preceding song, but it also has the same effect for the rest of the album. It suggests that the narrator (Vernon, in all likelihood) has not changed or become “a new man” but is now accepting his loss. The second line is an excellent metaphor for how the song (and his creating of the album) is the result of him accepting this acceptance. He has unlocked his grief and it’s become a weight off his mind. The final line is perhaps my favourite of not only this song but the handful of LOTWs I’ve done up until this point. The best lyrics are mostly the simplest ones and this is a perfect example. As well a being a brilliant line on it’s own, in this context it suggests that the love the narrator and the former partner shared will still always be there, but there’s no sadness anymore, just a great memory. In a funny sort of way, it’s a happy ending to the album. If you haven’t already got For Emma, Forever Ago, then I strongly urge you to get it. It’s a fragile, beautiful and frankly timeless masterpiece that really should be up there when the “greatest albums of the 21st century” lists do the rounds. There has been a lot of hype (much of which you can read above) but, as occasionally happens, it really is justified. Re: Stacks is the standout track from an already outstanding album, which you’d be insane to miss. I’m fresh out of superlatives so I’ll let the track do the talking. Listen or download below.